The PHI X-tool is the newest in PHI’s range of XPS (X-ray Photoelectron Spectroscopy) instruments, and is designed to make XPS instrumentation accessible to a wider audience. Automated XPS measurements can now be conducted by those who aren’t experts in surface analysis. The system features an intuitive touch screen user interface and automatic processes, including sample loading, analysis and report generation. 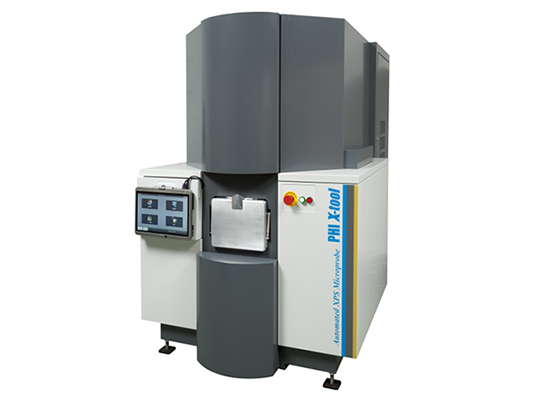 The PHI X-tool is capable of detailed elemental and chemical analysis using XPS, which is also commonly known as Electron Spectroscopy for Chemical Analysis (ESCA). The X-tool delivers high performance sputter depth profiling (thin film analysis) and XPS imaging to observe changes in surface composition, as function of depth or spatial distribution. The robust PHI X-tool is ideal for both small and large area routine XPS measurements, using PHI’s patented scanning XPS microprobe technology. Interactive mode allows the user to define analysis conditions, with interactive research or failure oriented analysis. The system’s analytical capabilities include small and large area spectroscopy, XPS mapping and sputter depth profiling. An internal optical microscope and X-ray beam induced secondary electron imaging are available when selecting areas for analysis. Areas for analysis can be defined quickly and easily using the touch screen user interface, on optical images or X-ray beam induced secondary electron images. XPS measurements can be defined at single or multiple sample locations for automated analysis. Predefined measurement protocols can be selected with a single button, or the user can define a measurement with the software. Basic reports, including spectral displays and quantification of the detected elements are generated automatically once the spectral analysis is complete.